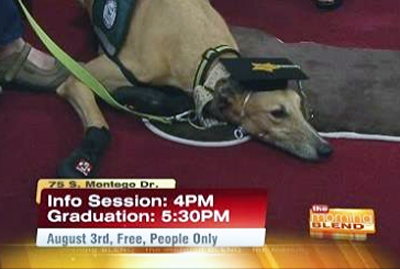 In 2013, Arizona Greyhound Rescue ("AGR") did something revolutionary. 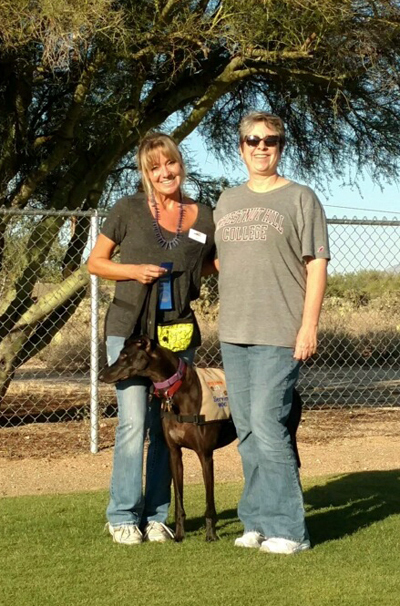 Through a strategic planning process, AGR decided to be the first organization in southern Arizona to focus on all sighthounds and offer adoption, fostering, and service dog companion programs. With this mission in mind, AGR has made a commitment to service our community by developing a service dog companion program that will allow sighthounds, particularly retired racing greyhounds, to find a new leash on life and help those who need it the most, our disabled and veteran citizens of our community. To help launch this new program, AGR came up with the name “Heartfelt Hounds”. 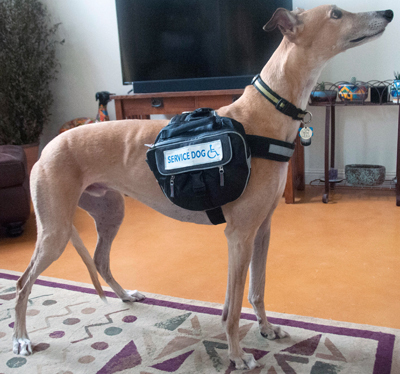 Heartfelt Hounds is unique in that it places sighthounds as service dogs. Sighthounds, especially greyhounds, are growing in popularity because of their amazing temperaments. They have been handled by multiple humans their entire life, are accustomed to remaining docile in new situations, and they adapt to new sounds and movement. They have a gentle nature and are an easy breed to maintain and care for on a daily basis. Greyhounds are tall enough to be accessible to virtually all people regardless of their form of mobility while keeping all paws on the ground. Heartfelt Hounds mission is to give individuals with disabilities, especially veterans functional independence, improved quality of life and enable them to live in a safe and healthy environment. Individuals who have received sight hounds through AGR’s Heartfelt Hounds Program have found the confidence to resume a more normal routine. This program also give AGR the ability to place more sighthounds. Meet our newest Heartfelt Hound in training! Kip is a lurcher, 7/8 Greyhound and 1/8 Coonhound. Lurchers are used in an underground racing and lure coursing operation. He is from the American Lurcher Project in Ohio. These dogs are either ready now or will soon be ready to be matched with a person. Please read about the Heartfelt Hounds we have placed with partners or are currently in training and awaiting a match with their person. AGR believes that every sighthound is unique and has its own personality, which must be the starting point to finding a perfect forever home. Some dogs are meant to retire and become family pets. Others are meant to follow a different calling and become service dogs for individuals who need companions to assist them through their daily routine. These dogs provide individuals with devoted service, dignity, and hope. Service hounds in good health often work until 10 to 12 years of age. 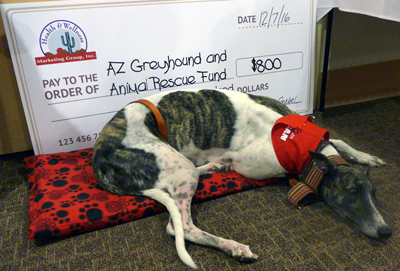 AGR started Heartfelt Hounds, its new companion program, because there is a great need for this type of program in Southern Arizona. Historically, there has been very little assistance to help individuals with disabilities and veterans to obtain service dogs. Over the past three years, AGR has successfully placed six (6) sighthounds as Service or Emotional Support dogs. There are two (2) more hounds in training. Individuals who have received sight hounds through our Heartfelt Hounds program have found the confidence to resume a more normal routine. This program also provides a future for sighthounds rescued by AGR. Staffing for the Heartfelt Hounds program within AGR comes from our wonderful trained fosters that provide temporary homes for each dog until it is matched with an appropriate recipient. At that time, the recipient enters the Heartfelt Hound program and will foster to adopt their dog for the duration of training. Mr. Fry was the Canine Therapy Manager at Sunrise Senior Living in Tucson. He was nominated for a Hero Dog Award! Sadly, Mr. Fry crossed the rainbow bridge in August, 2017. Heartfelt Hounds trains rescued sighthounds as service dogs to be placed with individuals with disabilities and veterans who suffer from medically recognized injuries and disorders. 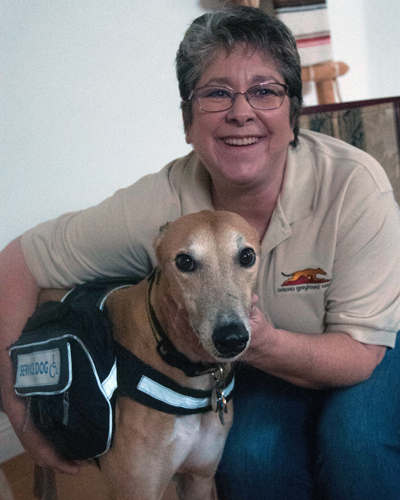 President Jean Williams and her Greyhound Service Dog, Blaze, appeared on Morning Blend for International Assistance Dog Week August 2 - 8, 2016. AGR is a founding partner of the Rescue to Service program in collaboration with Handi-Dogs. 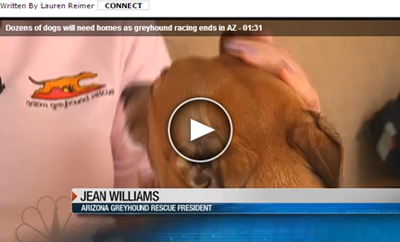 Here are Blaze and Jean in the KVOA story: "Dozens of dogs will need homes as greyhound racing ends in AZ". 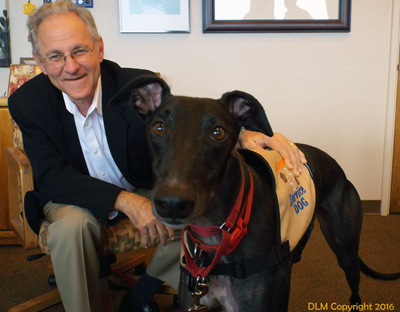 Trick, AGR service dog in training, is helping Tucson Mayor Jonathan Rothschild, promote Don't Leave Me, an organization that educates the public that Hot Cars Can Kill. Thank you to Health and Wellness Marketing Group for supporting AGR's Heartfelt Hounds!